Back in the day, making a backup of our computer’s contents required spending hours dealing with tape drives and/or endless CDs. These days, everything is a tad easier courtesy of DVDs and zip drives. However, is there perhaps an even simpler solution? Yes, there is! It lies in cloud storage technology. Imagine the Internet is a cloud, and imagine that this cloud contains everything on your computer. Not only that, but this cloud automatically backs up new files the moment they’re created. And the best part of all this is that you can access this cloud at anytime and from anywhere. Sound interesting? Well, let us introduce you to LiveDrive! LiveDrive is a 5+ year-old company that provides cloud storage solutions to over half a million customers across the globe. Since its inception in 2008, it has grown by leaps and bounds. Not only that, but it has received awards like the Computer Active Best Only Backup Buy It award and the Web User Gold award. It offers a slew of services, including online file storage, file sharing, file syncing, Facebook integration, online editing and more. It offers two main forms of service — personal service and business service. We recommend going with a personal solution, but we’ll definitely cover both personal and business options. 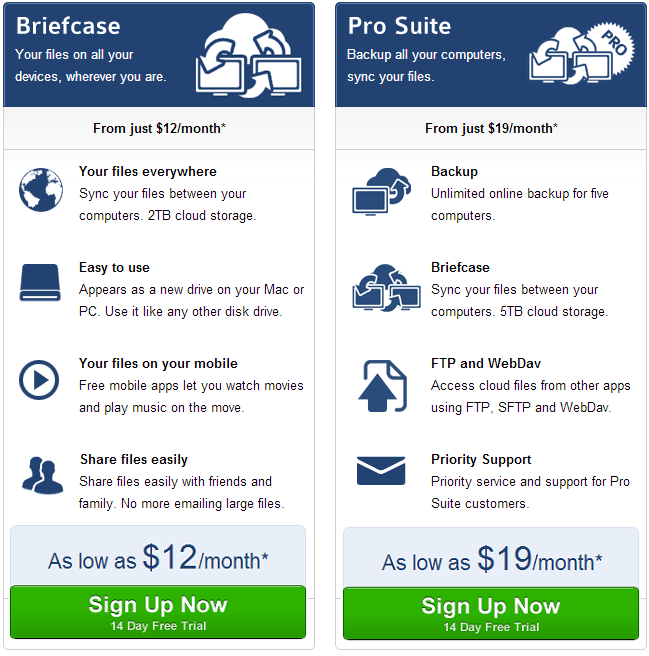 LiveDrive offers three personal solutions, including a Backup solution for $6/month, a Briefcase solution for $12/month and a Pro Suite solution for $19/month. The amazing thing is that each one is available with an absolutely free 14-day trial. 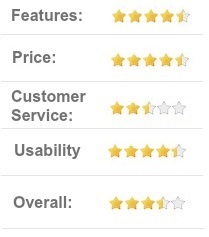 We recommend taking advantage of the trial to get a feel for the company’s services. Note also that taking advantage of the trial does not require submitting credit card information! This simple solution offers unlimited backup space for a single computer. It works in the background and constantly backs up your content so that you can access and/or retrieve it at anytime. You can add additional computers for $1.50 extra per month. Or you can add a network drive or NAS for $8.00 extra per month. You can access the files on your online drive from any computer with a Web browser. You may also access them from iOS, Android and Windows Mobile devices. You can directly stream audio and video content from your drive. We really like this feature, because it makes all your media content very easily accessible. You can restore deleted files within a 30-day period. 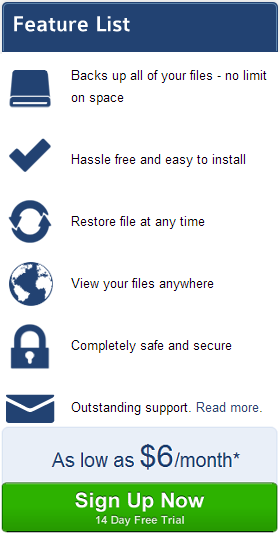 Plus, LiveDrive keeps previous versions of regular undeleted files accessible to you. All data transfers into and out of LiveDrive’s cloud servers are encrypted with military-grade AES-256 technology to ensure maximum safety. It’s not a bad service, but we do wish they offered a free alternative. However, it’s not bad, especially considering you get an unlimited quantity of storage space for just $6 a month! You can directly edit documents and/or update photos by just logging into the cloud server from any compatible Web browser. You can add as much additional space as you need at a very fair rate of $8.00 extra per month. That’s a really nice price for what you get. You can automatically share files on social network accounts or link them to your friends and family. Last but not least, you can email files to your drive. We really like this solution. Yes, you don’t get the auto backups, but do you really even need them? The nice thing about this is being able to so easily sync content. It makes life a lot easier for people who travel a lot and are constantly on different computers and devices. This is the ultimate solution. It functions more like the Backup solution, except that it offers unlimited online backup storage for five PCs. Also, it entitles you to 5TB of “Briefcase” space. We recommend this very affordable option for families. It provides all the backup services you need, as well as that huge 5TB of space for keeping all your media files easily accessible from any and all devices. The Pro Suite option also lets you access your files using advanced tools like FTP or WebDAV. The Business options are also available with a 14-day trial. However, fees go up to $37 a month for Express service and $135 a month for Standard service. The goal of these services is to backup office computers and also make office files easily accessible for employees on the go. This service offers three user accounts and a total of 2TB of online space. It adds a few notable features that are not present in the personal options. For one, you get to access the drive using more advanced tools like FTP, SFTP and WebDAV. Plus, you can brand the drive with your company logo. It is otherwise equivalent to the Personal options. However, you cannot expand the quantity of space or the number of user accounts. Those are completely locked up, unless of course you upgrade to the Standard service. You can set up ‘Team Folders’ for collaborative work. You can set up your own portal at companyname.livedrive.com. You can add additional users for $11.75/month. You can add additional space at $6.25/month per TB. You can set user permissions. Obviously, you only need this if you run a pretty big business. We imagine that the personal solutions will work best for the majority of you. You need to login to access the support page. Even worse, support is limited to email, as well as a ticket system. The staff usually gets back to you very quickly, but a phone or chat option would be appreciated. Other than that, you get access to a huge ‘Knowledgebase’ brimming with useful information. The customer service could use some improvement, but it’s not horrible. Note also that these services are only available to paid customers. Overall, we were fairly impressed with LiveDrive. What really got to us is its compatibility. It is compatible with everything: Windows PCs, Macintoshes, Apple iPads, Android phones, iPhones, Windows Mobile phones, etc. Plus, it has apps that let you watch films or listen to songs that are stored on your drive. This makes it extraordinarily convenient for the modern masses, many who would love to be able to just pull up a song or video on their smartphone while they’re waiting for a doctor’s appointment or whatnot. We do wish the company offered a free solution. We also wish it provided better support. However, these are definitely not deal breakers, especially considering the fair and equitable rates. We consider $6 to $12 a month to be more than fair, and we are pretty sure you would agree. 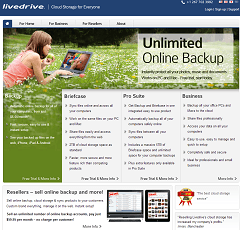 With that said, if you want to take advantage of cloud services, we fully recommend you choose LiveDrive! We also recommend that you start with the trial first just to get a hang of things.